/ Modified jul 28, 2014 12:58 p.m. Inside the Tucson streetcar on its inaugural run, July 25, 2014. 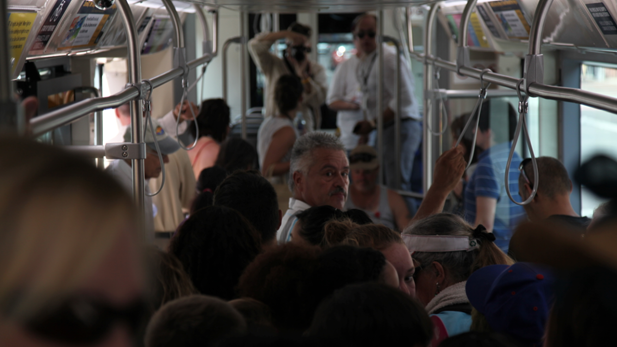 An estimated 60,000 people braved broiling heat this weekend for a chance to ride Tucson’s streetcar for the first time. The streetcar system recorded 17,000 riders on Friday's inaugural day, 25,000 on Saturday and 17,000 Sunday, project manager Shellie Ginn said. The streetcars traversed the four-mile corridor, followed by overflow buses to transport people who no longer wanted to wait to get into the packed streetcars, which were running for free during their first weekend of service. Volunteers were stationed at each stop to help with boarding, hand out bottles of cold water and make sure passengers used crosswalks after disembarking. The handrail on one streetcar came loose because so many people were holding onto it, but otherwise there were no service issues, Ginn said. Ginn described the opening weekend as very successful. She said officials weren’t sure how many people would turn out, especially on Friday during work hours, but that the trains were full throughout the three days. A conductor on Monday morning's first eastbound run said service was supposed to stop at 8 p.m. Sunday but continued past 10 p.m. because people continued to wait at the stations. Starting Monday, regular fares will be charged on the streetcar. A one-way trip will be $1.50. Kiosks at the streetcar stations will sell only $4 passes good for 24 hours, and the machines accept only exact change and credit cards. Other passes can be purchased online or at any of the municipal transit system's three centers.